The first quarter was a seesaw affair that saw both teams flex their muscles but neither take control of the game. 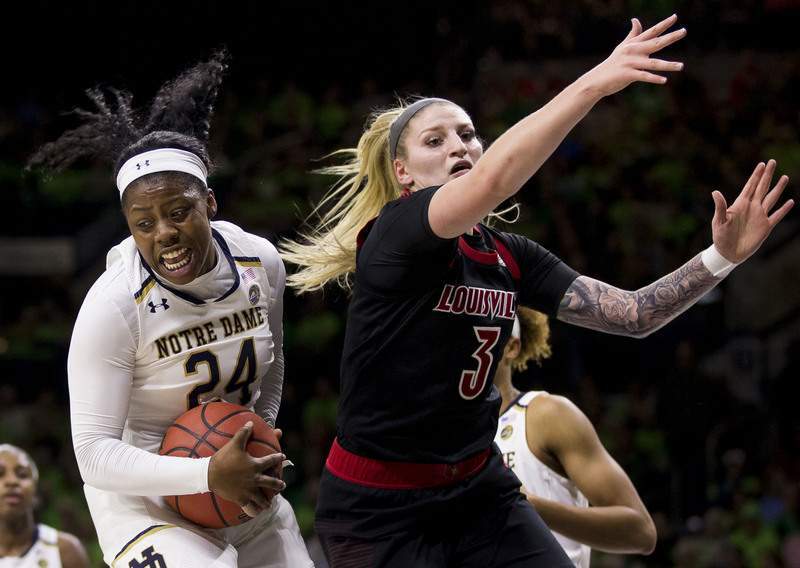 The Cardinals were able to shut down Irish leading scorer Arike Ogunbowale, who did not have a field goal in the opening quarter, while Louisville's Asia Durr poured in 10 points. Still, Notre Dame led 20-19 at the end of the first thanks to good work on the boards by Jessica Shepard and several baskets in transition. The Irish tried to push the ball off every Louisville miss and the gambit worked. Most of the second quarter was a different story, however. The Irish went ice cold from the field while Durr continued score in a variety of ways. Notre Dame shot an anemic 14.3 percent from the field in the quarter as Louisville surged ahead by as many as seven points on a couple of occasions. The mostly-full Purcell Pavilion crowd did everything it could to will the Irish back into the game, but with Ogunbowale still struggling, it was a difficult. Near the end of the half, however, Notre Dame woke up. The Irish still couldn't hit from the field – they missed nine of their final 10 shots in the half – but they clamped down on defense and Shepard continued to dominate on the glass. At halftime, the senior forward had already pulled down an incredible 13 rebounds and the Irish were 17 of 23 from the free-throw line, helping them pull within 35-33 at the break. The Irish carried over their momentum from the first half into the early third quarter, immediately going in front when Marina Mabrey drilled a 3, the first of the game for the home team, and eventually extending the lead to as many as five points on several occasions. As the third quarter wore on, the fouls began to pile up, especially for Louisville, and the game became a whistle-fest. Midway through that third quarter, five Cardinals had three personal fouls. The Irish continued to lead late in the third and pressed their advantage as the game got a little chippy. At one point, Ogunbowale and Louisville's Sam Fuehring got tangled up on the ground and words were exchanged. Fuehring said something to the Irish bench as she walked off the court during the next timeout, bringing a cascade of boos from the crowd, but no technicals. Ogunbowale got the last laugh when she buried a massive 3 from the top of the key in the final seconds of the third quarter to make it 57-47 Irish going to the fourth. The Irish lead stayed comfortable until late in the final quarter. With about five minutes left, Louisville mounted an 8-0 run and sliced the Irish advantage to just two. The Cardinals' Mykasa Robinson punctuated the run when she stripped Ogunbowale and raced the other way for a layup that forced Notre Dame to call a timeout to regroup with 2:39 left. That was as close as the Cardinals got, however. Ogunbowale scored out of the timeout and then buried a 3 from the right that wing that made it a seven-point advantage and put the game away. As the shot fell, the crowd exploded and Ogunbowale leapt in the air, knowing she'd retained the No. 1 ranking for her team. The Irish's star was bottled up in the scoring column for much of the game, but energized her team in other ways until scoring opportunities opened up for her in the third quarter. She scored a team-high 30 points, including 26 in the second half, and added five rebounds and six assists. Her 3 at the end of the fourth quarter was arguably the biggest shot of the game. It was her fifth 30-point performance this season. Notre Dame is 103-3 in its last 106 home games. All three losses have come to Connecticut. ... This was the eighth 1-2 matchup the Irish have played in. They are now 2-6 in such matchups and 1-1 this season. They lost to then-No. 2 UConn on Dec. 2, 89-71. ... There were 14 ties and 10 lead-changes. ... Notre Dame came in with a streak of six straight games shooting above 50 percent. The Irish shot just 45 percent against the Cardinals. ... The Irish came in No. 6 in the country and leading the ACC in assists per game with 20.1. They dished off 14 assists on 25 made field goals tonight. ... Notre Dame outrebounded Louisville 48-32, led by Shepard's 15 boards. ... The Irish turned the ball over 18 times, compared to just eight for Louisville. The Cardinals had a 25-16 advantage in points off TOs. ... Notre Dame shot 32 free throws to Louisville's 16. ... Durr led Louisville with 29 points on 9-for-20 shooting. The Irish return to action Sunday at Purcell Pavilion, when they take on the Wake Forest Demon Deacons (9-5, 0-1). The game will tip off at 1 p.m. and will be broadcast on the ACC Network. The Demon Deacons will be coming off a matchup Thursday against Boston College. They already have a 87-73 loss to Indiana on their record.